Later this month, Italian luxury lifestyle brand Chucs will open a fourth “cozy and calm” London café at the Serpentine Sackler Gallery in the middle of Hyde Park. The Mayfair original, adjoining a Chucs store in Dover Street, opened in 2015, followed by a restaurant at the brand’s Chelsea shop and an outpost in Harrods in 2016 and 2017 respectively. 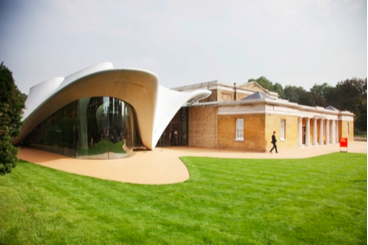 Chucs Serpentine is set within The Magazine, Zaha Hadid’s landmark extension to the Serpentine Sackler Gallery. A design collaboration between Stiff + Trevillion Architects, Peter Mikic Interiors, and Isometrix Lighting and Design, the 86-cover restaurant will evoke the 1950s Italian attitude of the Chucs brand. Open for breakfast and brunch through to lunch, afternoon tea and dinner, the menu at Chucs Serpentine, designed by group head chef Carlos Martinez and exec chef Alessandro Verdenelli, includes a number of dishes exclusive to the restaurant, including: Pastarelle fritti, macadamia and dried fruit salsa for breakfast and Pea & mint risotto with Reggiano and micro watercress and Green harissa lamb rump, mint gel and cucumber for lunch. Verdenelli’s new offerings will sit alongside a number of Chucs Italian classics, such as: Bigoli Cacio e Pepe and Yellow fine tuna tartare with baby gem. The menu is complemented by an ever-changing wine list with a focus on seasonal Old World and New World wines, and a wide-ranging cocktail menu including classic favourites from Vodka Martinis to Negronis to Old Fashioneds. A three course set menu will also be available for £25, as well as a children’s breakfast and all day menu, comprising of homemade ice creams, juices and milkshakes. Exclusive to Chucs Serpentine is a take-away menu for those who wish to enjoy their meal outside in the Royal Park, offering a selection of paninis including Spicy Italian and various types of Pizzette, homemade ice creams, and Tiramisu. Grouse, glorious grouse - we're anxious to try it! News Alessandro Verdenelli, Carlos Martinez, Chelsea restaurants, Chucs, Chucs Serpentine, Harrod's, Hyde Park, Isometrix Lighting and Design, Italian restaurants, London, London restaurants, Mayfair restaurants, Peter Mikic Interiors, Serpentine Sackler Gallery, Stiff + Trevillion Architects, The Magazine, Zaha Hadid. permalink.